A delicious twist on the classic Alfredo. 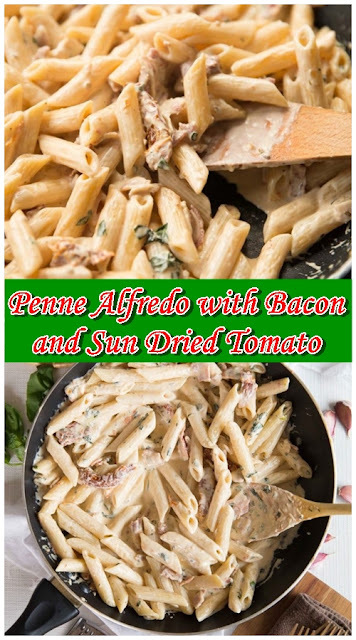 Penne Alfredo with Bacon and Sun Dried Tomato will change your ‘go to’ quick dinner forever! Meanwhile, fry your bacon over medium heat until it begins to crisp. Drain excess fat/oil if there's too much, then add your garlic & sun dried tomatoes and fry for a minute or so longer. Add your Butter and stir until melted. Stir in your cream and allow to simmer on a low/medium heat. When it just starts to thicken add in your parmesan, basil and seasoning to taste.